Puppy teething can be painful and as your little guy's first milk teeth come through he'll begin to chew on almost anything in a bit to relieve his discomfort! Learn more about your puppy's first teeth, how to stop your puppy biting and how you can help ease him through this troublesome teething phase. Just like babies, puppies don't have any teeth when they're first born, which I'm sure is a relief to their Mom! But unlike baby teeth, puppy teeth are as sharp as needles and if you're unlucky enough to be on the other end of them, you'll certainly know about it! 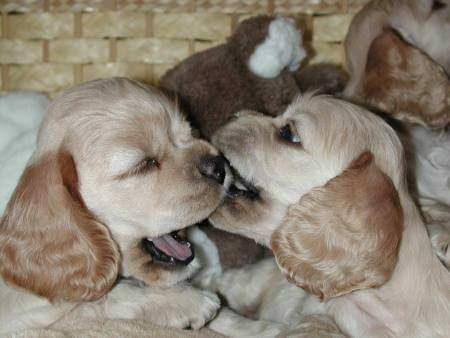 Milk teeth (or deciduous teeth) can begin to make an appearance when puppies are around three weeks' old. The incisors are usually the first to push through the gums. These are the tiny teeth at the front, 6 at the top and 6 on the bottom. 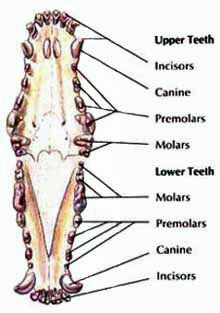 Next to come through are their four canine teeth (one at either side of their incisors, top and bottom). And finally, out pop the twelve premolars and molars (three on each side, both top and bottom of his mouth). A puppy should have his first set of 28 sparkling white, but very sharp puppy teeth, by the time he's 6 to 8 weeks old. Puppy teething can go on for months (if you include their milk teeth coming through and then later, their adult teeth) and during this time your pup will bite and chew almost everything in sight to try and relieve his pain and discomfort. You can help to soothe your puppy's teething pain by giving him lots of teething chew-toys. When puppies chew, they don't discriminate! Unfortunately, your puppy will probably chew on the things you don't want him to chew on, like your new leather handbag or suede slippers! Make sure this doesn't happen to you; keep your precious things tucked away out of sight! Choose a varied selection of teething rings and chew toys so that your puppy can relieve his discomfort on a safe toy rather than chewing your prized possessions. These teething chews will allow him to bite and chew safely (and without damage to your home) while the chewing action will help to relieve the pain and discomfort he may be feeling. Rope toys are also safe for your Cocker, but remember, puppy teeth are quite fragile and can break easily so take care playing tug of war games. Puppy teething also tends to cause a lot of drooling so you'll need to have lots of wipes at the ready! You may also notice a few blood spots on his chew toys as his puppy teeth break through the surface of the gum. You puppy may seem to go off his food for a while. This isn't unusual as the act of chewing on his kibble can be painful at this teething stage. If your puppy finds it painful to crunch on his kibble, try softening it with boiling water 30 minutes before he's due to eat. It will make his food much easier for him to chew and you can be sure your precious puppy is eating something! Top Tip: When Max was teething, I would roll up a face cloth and put it in a plastic freezer bag. I'd then pour chicken stock onto the cloth and soak it thoroughly before freezing it. I also made up a batch of chicken or beef stock ice cubes. Occasionally, when there were leftovers, I would add little bits of shredded beef or chicken as a special treat! Either way, chewing the ice-cold cloth or biting on the frozen stock cubes helped to numb his gums and lessen the pain. Job done! Puppies begin to lose their baby teeth at around 12 weeks and usually by 28 weeks they should all have dropped out to allow new adult teeth to come through. Many dog breeds have 42 adult teeth in total: 12 incisors, 4 canines, and 8 premolars in each of the top and bottom jaw; then there are 4 molars in the top jaw and 6 in the bottom. Don't quote me on this, but because Cocker Spaniels tend to have more than their fair share of teeth, they often have a few more than this! Your Cocker's full set of adult teeth should be complete by the time he's 8 months old, but all dogs develop at different rates (just like our children!) so don't be too worried if they arrive a little before or after this time. And don't be alarmed if you don't find any of his puppy teeth either. If you don't manage to see any lying around, it's likely that he's swallowed them, although you may find one stuck in a chew toy! Once your puppy has his new adult teeth, and you've managed to control his gnawing with chew toys, he should be through the chewing phase by then, however, there aren't any guarantees. If your pup's still chewing, I recommend you correct this now before it becomes a real problem. As his second phase of puppy teething begins and his new adult teeth start to come through, it's wise to check them just to make sure they're coming through okay and that his baby teeth are dropping out naturally. Milk teeth need to give way readily to adult teeth otherwise it can lead to problems. A stubborn milk tooth may force the adult tooth to grow in the wrong place, for example, too close to the next tooth or it may be forced in front of, or behind, another tooth. This can cause hygiene problems because you won't be able brush between the teeth properly, which could lead to decay and periodontal disease. If you find that one of his adult teeth is breaking through really close to a baby tooth, a baby tooth that feels like it's not going anywhere anytime soon, I would take your puppy to see his vet. The stubborn milk tooth will probably need to be pulled out. NEVER do this yourself. (Sorry for shouting, but it's really important). Your vet will probably take this opportunity to check your puppy's mouth for bite problems and will be able to advise you about on-going dental care for your Cocker. Puppies play and explore their world using their mouths and whilst these little mouths are capable of doing some damage, their adult mouths will be capable of doing much more. Puppy nipping, in comparison, is a lot less damaging! Have you ever wondered why puppies teeth are as sharp as they are? Their teeth are sharp so Mom can teach them to bite with a soft mouth; bite gently. Although it's mainly down to Mom, brothers and sisters will help too. For example, when puppies are play-biting and one bites too hard, because the teeth are so sharp, the bite really hurts and the puppy being bitten will yelp loudly and move away and will stop playing. The biting puppy soon realizes that rough play ends the fun. This teaches the puppy, at a very early age, not to bite too hard. Unfortunately, puppies often go to their new home when they're eight weeks old (sometimes earlier!) often before their mother has done her job. It will then become your job to teach your puppy not to bite.